I'm not a big collector of bootlegs, especially since FTD started pouring out unreleased material. But sometimes I make an exception, and the last few days I've been listening a lot to the Madison release Closing Night - February 1970. As you may know, this is the closing show from 23 February, and that's one reason I decided to get my hands on it. Another is the fact that, as far as I know, this is the first time a soundboard with a complete show from this Las Vegas engagement is available. It's great to finally hear the showstarter "All Shook Up" followed by a complete version of "I Got A Woman." Also, the show in itself is first class with Elvis is in a great mood singing with a raw voice and delivering the goods. Unlike the 1969 engagement there's a lot more contemporary material such as his new hits "Don't Cry Daddy" and "Kentucky Rain" and covers like "Sweet Caroline" and the showstopper "Polk Salad Annie." There's still plenty of old rock 'n' roll numbers in the repertoire, and as short as some of them are (I clocked "Long Tall Sally" at 1:08!) Elvis still sings them with passion and not like later on in his career. Two highlights as far as I'm concerned are "Let It Be Me" with some serious high voice singing at the end ("Sing it, Myrna!") and also a cool version of "See See Rider." 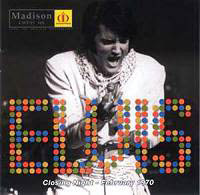 I do miss "Walk A Mile In My Shoes," but that one is included as a bonus track from February 18 so Elvis is forgiven. One song that does sound strange in parts is "Love Me Tender." There's a lot of bell chiming involved, especially in the beginning, and that makes me think of a Christmas carol or something! Even if the sound isn't as perfect as on the multi-track recordings RCA did a couple of days earlier it's still very good. In fact, this release is top quality, with a 16-page booklet and a cover that is a nice tribute to the On Stage album. Actually, it's very similar in style to the one on the FTD release Polk Salad Annie, only this is how it should have looked. Closing Night - February 1970 is one release I wholeheartedly recommend. Of course, there's the question of this being a bootleg, but the way it complements the official releases makes it hard to ignore.